Disclosure: This is a compensated post in collaboration with Ashland Chamber of Commerce. As usual all opinions are my own. Thank you Ashland Chamber of Commerce for making NJB awesomeness possible. 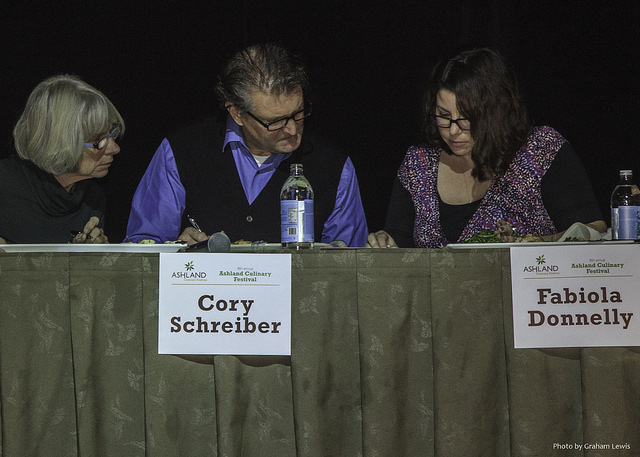 It was a pleasure to be a judge along side Mary Shaw from the Ashland Co-op and Cory Schreiber, James Beard Award Winning Chef, cookbook author, and Wildwood. First, I would love to tell how much I enjoyed Ashland, Oregon. Have you been? If not, it is a must, put it on the list for sure. It’s a sleepy, artsy, sweetest people kind of town with so much to do. Good breakfast from Brother’s Cafe every morning, all fresh, made in house or locally, and perfect to start your day. There are beautiful shops, and parks just a walk away from everything. You can’t walk a step without admiring the people and the natural beauty. It was a delight, relaxing, and I can’t wait to go back. Oh, have you heard? I was asked to be a judge for the next years competition, and obviously graciously accepted! 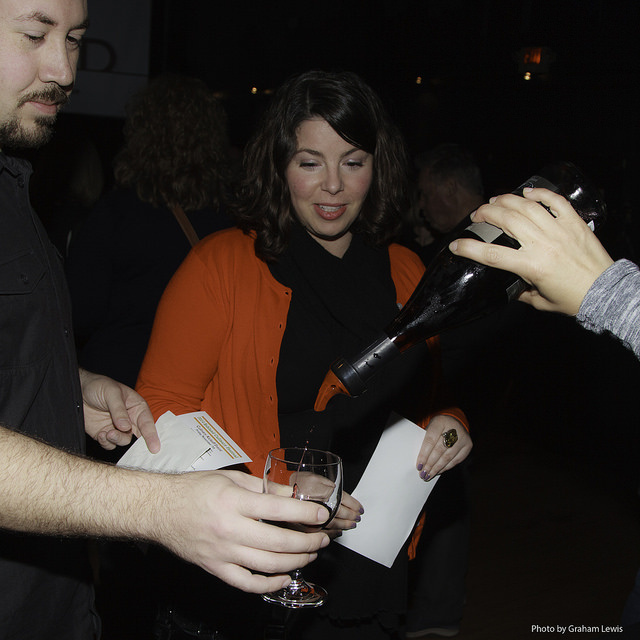 Brian and I admiring the wine. Photo by: Graham Lewis. What an experience! I knew I would enjoy judging a food competition, and did I ever. At first, to be totally honest, I was very confident in my ability and equally nervous. These serious chefs work so hard, blood, sweat and tears to present the judges with a dish in under one hour, some forty five minutes. And here I am, judging them. I needed my skills to be on point, I take this very seriously. Way more serious than I may look. I met one chef the first night, and he mentioned, oh so you are a blogger? So you eat out, and maybe know flavors? It was a pleasure to set the record straight. I smiled. Uh ya, I eat out, and know food. But I also was a chef in a kitchen, a baker, and pastry chef in a kitchen, went to culinary school as a student of Cory Schreiber’s and worked on many projects with him. My palate goes beyond “knowing food”, and you really have more to be worried about me judging than anyone else on the panel. It felt good! As I suspected, they want to be judged fairly, and I was proud to know I could do that for them. Judging! Photo by: Graham Lewis. It was intense the entire time. John from Cooks Kitchen sets up these hand crafted beautiful kitchens for this competition, and events like this all over the country. He is naming one after me! I’ll let you know where it ends up when he builds it and sells it. Anyhow, he sets up each kitchen meticulously, each equipped exactly the same. 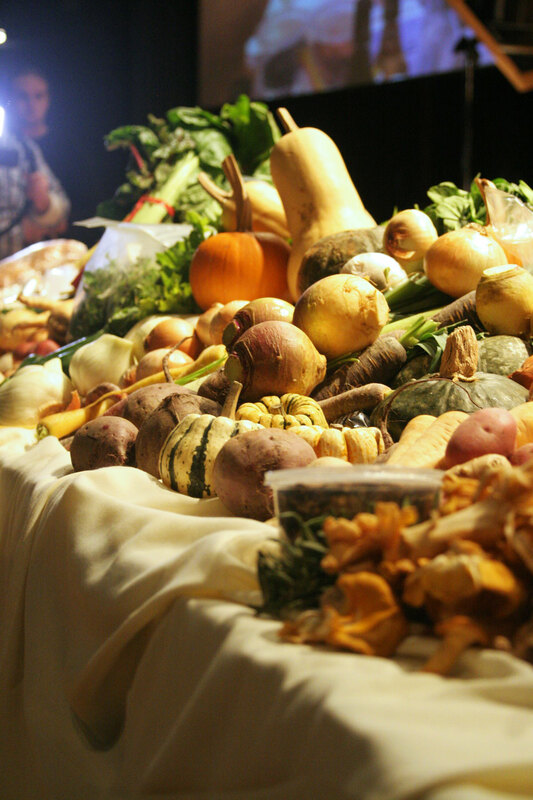 There is a gorgeous bountiful table with local and seasonal produce for each chef to use. 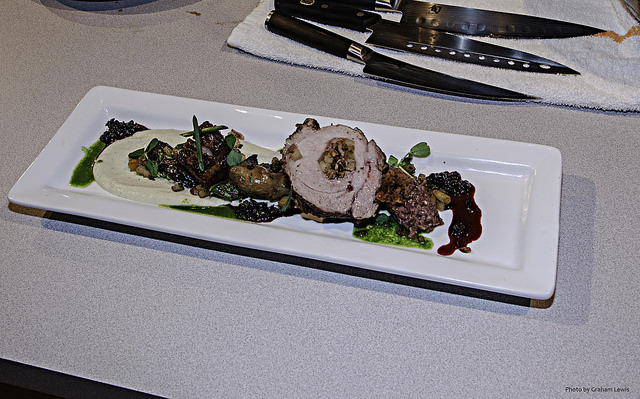 There were four rounds where there was a secret ingredients introduced by the emcee and fellow judge, Cory Schreiber. 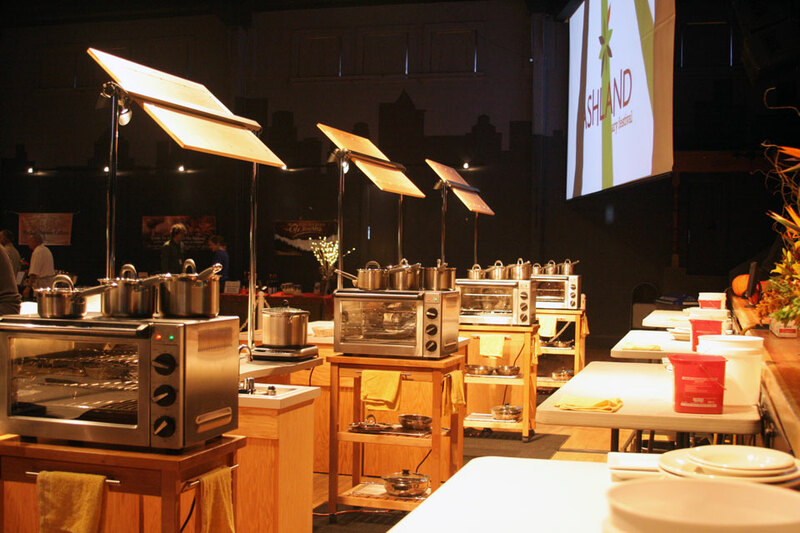 The first three rounds there was one winner, and a wild card with the highest points that advance to the final round where they compete for Top Chef 2014. I stood on a stage above the chefs for much of the competition, as it had the best over view of all of the chefs. I was watching techniques used, flavors extracted from the secret ingredients, sanitation, plating, and composition, all of which could take you from a winner, to losing for one mistake. It is that intense. All in all we tasted some beautiful dishes. Each round the winner was fairly obvious. And the last round was the craziest, obviously. They cooked their hearts out, gave us everything they had. And in the end there is only one winner. The winner, James Williams from Omar’s Fresh Seafood and Steak, an eight year competitor, one time winner. 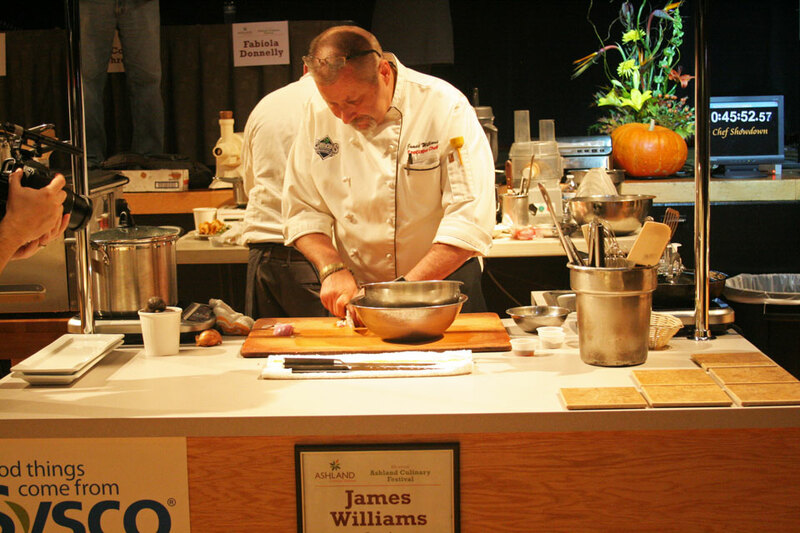 James has been cooking in this competition and had never won until this year. He is a fierce and calm competitor, a bit serious when we first met. He, as well as the other chefs, take this very seriously, as they should. It is a unique environment, very Iron Chef/Top Chef feeling. James knows the competition feeling well, and he felt a major sense of accomplishment when he won. You could imagine the change in demeanor that came over his entire stance when we called his name. Eight years of this, eight very long years of almost winning, He was always near the top, just a spot or two from victory. I was actually elated and so happy for him when we tallied the points to see who would be the winner for 2014. To be honest, many people knew when they saw the dishes, who would win. His dish was impeccably presented, perfectly prepared, and executed. The winning dish was a delight to enjoy. James served us heart tartar (my favorite bite of the entire weekend) with a perfectly balanced citrus dressing. Seared pork belly, roasted stuffed pork loin with a chili ginger glaze, over a celery puree, pea tendrils, and huckleberry gastrique. It was a clear winning dish. Thank you for the image above of the winning dish by James! Photo by: Graham Lewis! I am honored and grateful to have been their judge. I am happy to be a part of this event family now, and excited to be a judge in 2015. Check out my other 2014 Ashland Culinary Festival posts where I interview the chefs, Part I and Part II! Oh my gosh, that winning dish looks like the stuff of my dreams! The entire festival sounds so fun! Looks like such an amazing time!! Thanks, Rachel! It was awesome. It sounds as though that was a fantastic experience! 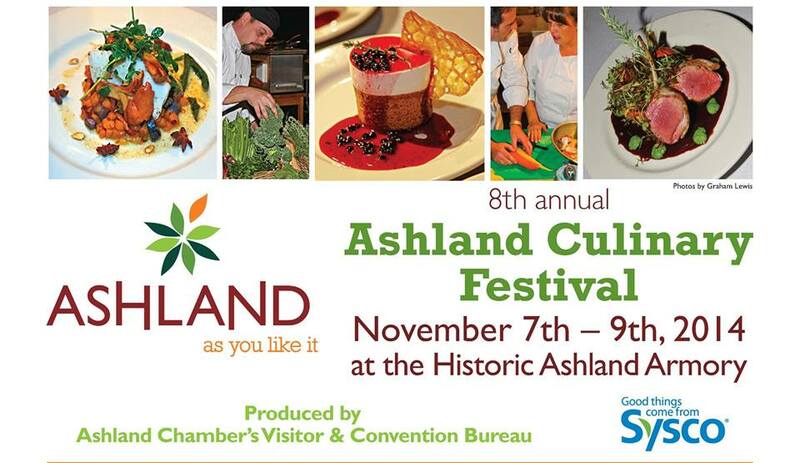 Ashland is a fantastic town, and I’ve heard great things about the culinary festival. It really was great, thank you! Oh man this looks like so much fun! Thanks for sharing! My pleasure, it was so fun! What an amazing experience! Great pictures, and I am sure everything was amazing! What a fun experience….I love the whole section about oh, you are food blogger! Too funny. what an amazing experience to judge! and that pork belly….wow. Oh yes, the pork belly! It was perfect. What a fun experience. I am wholly envious! Awe, thank you! It was pretty cool.